A blog exploring the historical and contemporary practices of witchcraft, folk lore, and magic in the Appalachian Mountains. "No witches were ever burned alive in North America." That is what we are taught when we listen to historians of American history discuss witchcraft trials in colonial America as well as the few rare trials of witchcraft accusations after the colonies. The historians are correct, in a way. 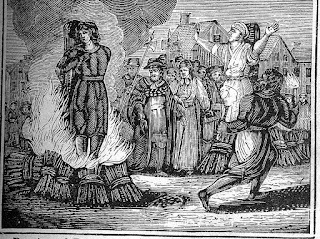 There are no legally documented executions by burning for women and the few men accused of witchcraft. However, they are wrong to say that no one was ever put to death by being burned alive for accusations of witchcraft. What I wanted to focus on here is the forgotten women, the murdered women, the witches of Appalachia. The women that now only exist in the memories of oral history. The oral history of Rolph Hollow, in Fleming County Kentucky tell the story of the execution by burning at the stake of Hulda (Collins) Lamar. Daniel Rolph, in his book "To Shoot, Burn, and Hang," brings the story of Hulda out from the oral history and into written history, Two of Daniel's ancestors tell the story of the execution as they witnessed it. Both Sarah Smithers and her daughter Rose Effey Rolph were returning from a neighbors home whom they had attended to for her pregnancy as they were "granny women" and "midwifes." As they were returning home they came over a hill and heard a racket. 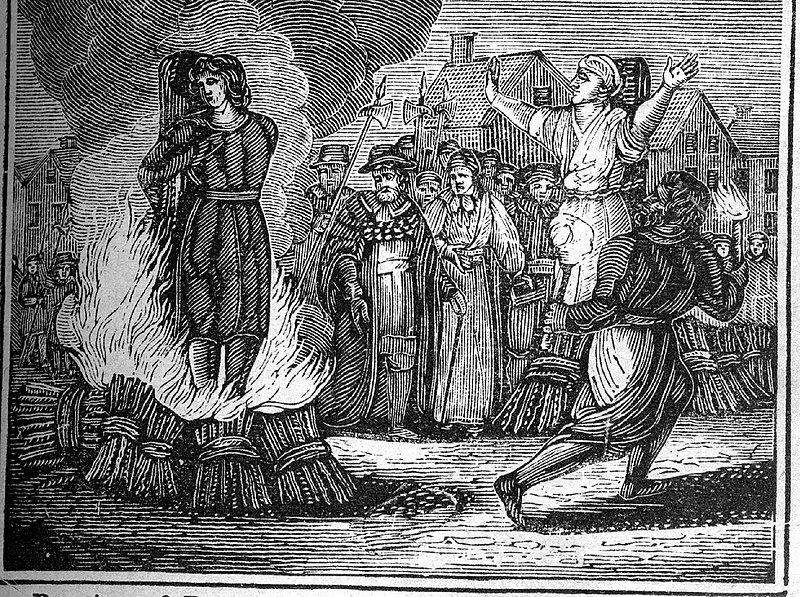 As they crept over the hill they began to smell a horrible smell, and saw that the people had tied a woman to stake and were burning her alive. Alice stated, "I will never forget the smell of burning flesh and the screams of the woman." They knew Hulda had been called a witch because of her use of herbs to cure people. Fearing for their safety, worrying that the townspeople would be coming for them if they were seen, Sarah and Rose hurried back to their home unseen. Hulda and her sisters, Mariah and Sal, were considered witches based on their use of gathering herbs and muttering as they did so. Many other stories surrounded the Lamar women making the accusations of witchcraft by the community that much more damning. Washington Lamar lived his aunts and told people that if he annoyed the women they would turn him into a cat, and he'd go up the chimney finding himself on the roof. Another story recalled that the Lamar sisters were not happy about their nephew selling a sow and her litter of pigs to Mr. Colgan. Mariah Lamar was said to have visited the Coligan farm the next day and was found rubbing her hands all over the pigs and mumbling peculiar words. The following day the sow and every nursing piglet was dead. It was also believed that the Lamar witches would place a death spell on people who harmed or wronged them in some way and the only way the spell could be broken was to get a wizard to take the spell off. The idea of the wizards coincides with the other oral history of other men and women visiting the sister in order to become witches and wizards as well. So why was Hulda the only witch burned that day, and not her sisters Mariah and Sal? Before Hulda was burned her sisters had already passed away. Dr. Alexander Wallingford when he heard that Mariah was dying went to attend to her, and to also see if the legend that a witch will die like a cat, all drawn up, was true. While Dr. Wallingford examined Mariah neither Washington Lamar or Sal Lamar asked the doctor to relieve Mariah's suffering with medication. Mariah is reported to have "died with her legs and arms drawn up like a cat's in its death grip." Ultimately, we find that Hulda and her sisters in the community's eyes were witches, and they were dangerous. Hulda found herself executed by "traditional" laws as opposed to any contemporary legal process. Ian was born and raised in the Southern Upland mountains of Southwest Virginia. He was born marked by God, according to tradition, in the form of a caul over his eyes. His living ancestor granny women helped raise him, and guide him into becoming a precognitive seer and psychic. From a very young age Ian could dream, receive visions, and have knowledge about other people that he met. He frequently saw and conversed with spirits that were not seen by others who were not born with the gift of sight. Ian has read cards for 20 years for friends and family. He has read professionally for the public for almost a decade. A reading with Ian is like visiting an old friend. So come and sit for a while, and let Ian help guide you on your path.